Summary: Childless couple, Willie Juan and Ana, share much of their lives with the neighborhood children. One evening Willie Juan asks a question ‘What do you think Abba will ask you in heaven?’ The conversations that follow, while eating Ana’s homemade sopapillas, help the children to understand that they are smack-dab in the middle of God’s love and that all the good gifts in their life are from God. Literary elements at work in the story: This story starts off acknowledging that ‘smack-dab’ is fun term to use and say. It gives its definition as ‘precisely in the center’ and then throughout the story has a repetitive use of the term ‘smack-dab’. The book drives the term home by reminding us that ultimately we are smack-dab in the middle of God’s love for us. Reading the book aloud and encouraging the audience to say ‘Smack-dab” with the reader each time it appears, would be a fun way to involve the audience in participating. Presentation of gender/race/culture/economic status/age/disabilities/etc: All ages and genders are represented in the illustrations in the story. The setting is in a small, modest Mexican village but many races are also represented by a variety of skin tones and hair colors and textures. The story has a strong sense of community and sharing with ones neighbor. The story introduces Hispanic culture in a way that explains the terms to those who may be new to them. Theological conversation partners: John 3:16-17, Romans 8:39, James 1:17, Heidelberg Catechism Question 1. The story also has a conversational style that allows the reader to imagine their own questions and responses to Willie Juan. What will you ask God when you get to heaven? If you’re smack-dab in the middle of God’s love, what is smack-dab in the middle of your love? What are some things should be smack-dab in the middle of your love? What might it look like to love God? What are some good gifts that you have been given from God? What are some ways that you can share your gifts from God? Who are the Willie Juan’s and Ana’s in your life? 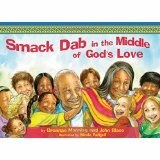 Smack Dab in the Middle of God’s Love by Storypath is licensed under a Creative Commons Attribution-NonCommercial 4.0 International License.